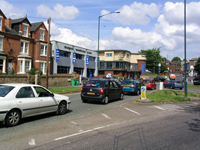 The portion of roadway from Lenton Boulevard as far as the junction with Willoughby Street and Abbey Bridge bears two names. 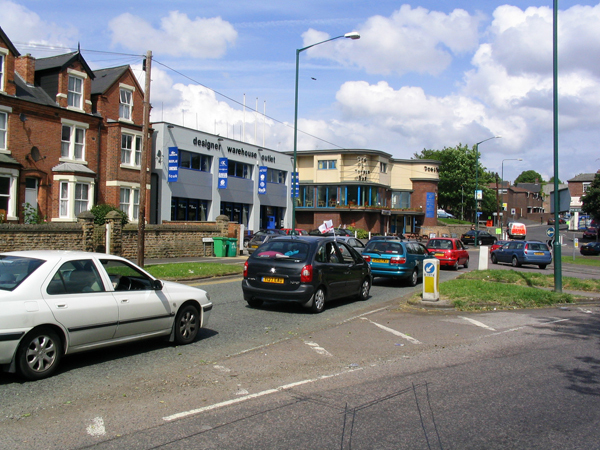 The side visible in this 2004 photograph is called Sherwin Road while the other side is identified as Castle Boulevard. 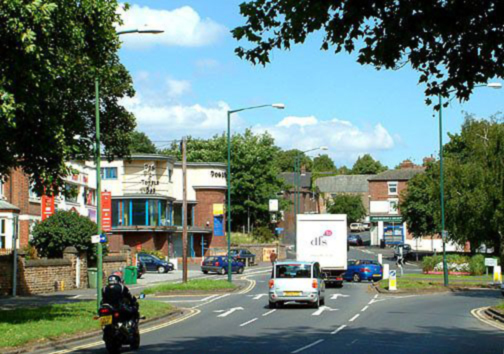 The Boulevard only dates from 1884 whereas Sherwin Road is a much older thoroughfare although its name in the early nineteenth century was Birch Lane. The Dog and Topper was a short-lived attempt to rebrand this Lenton pub. When it was originally built in the early 1970s the pub was called the 17th/21st Lancers. This photograph showing the 'Lancers' was taken in 1977. It also reveals that the building on its left was then used as the showroom for Castellini Dental Equipment. 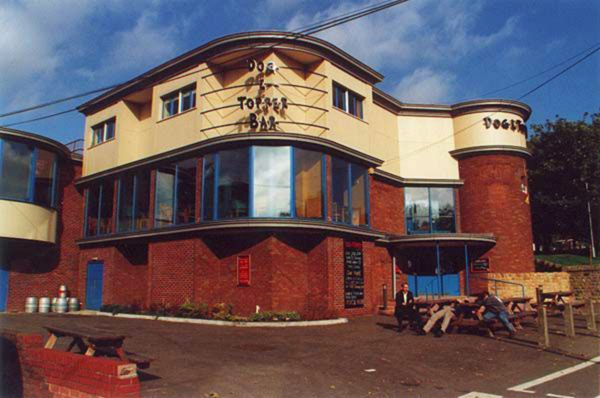 This photograph shows the Dog and Topper as it looked in 1999. When compared with the previous photograph it is clear that its owners spent quite a lot of time and effort, not to mention money, in the late 1990s trying to give the building a more modern feel. The 17th/21st Lancers was built in the early 1970s to replace this pub. 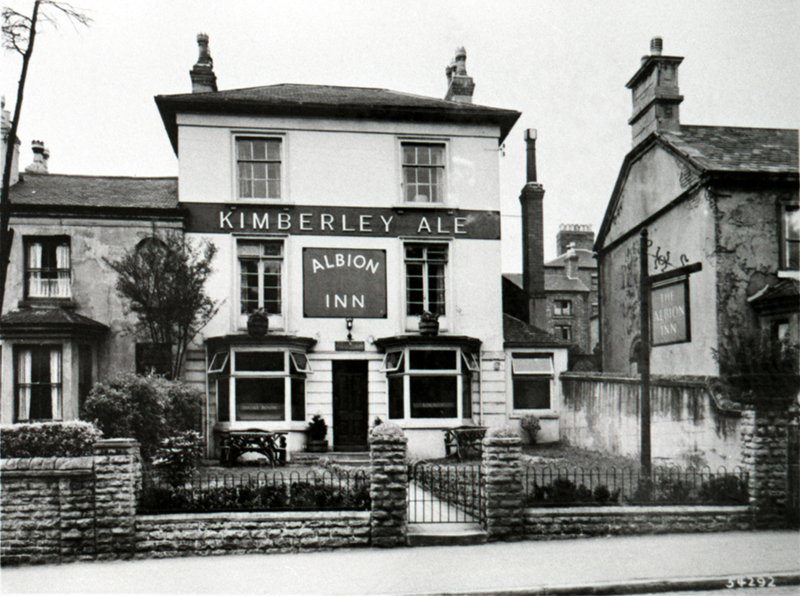 The Albion was one of Lenton's oldest pubs and dated back at least to the 1830s. Once the houses to the left of the Albion Inn were demolished as part of the Willoughby Street clearance scheme the new pub was built on their site. 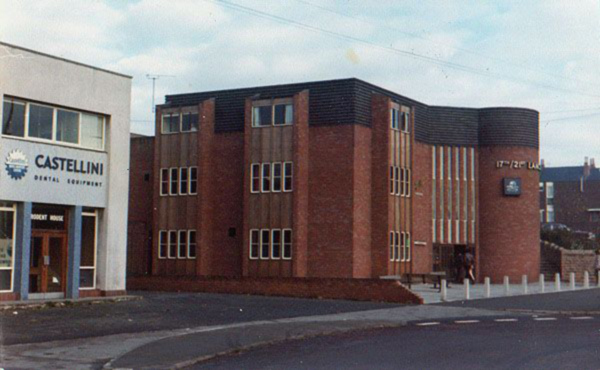 The existing licence was then transferred to the new building the old pub was demolished and the site incorporated into the Lancers' car park. We have no date for this photograph but believe it was probably taken in the late 1940s or early 1950s. 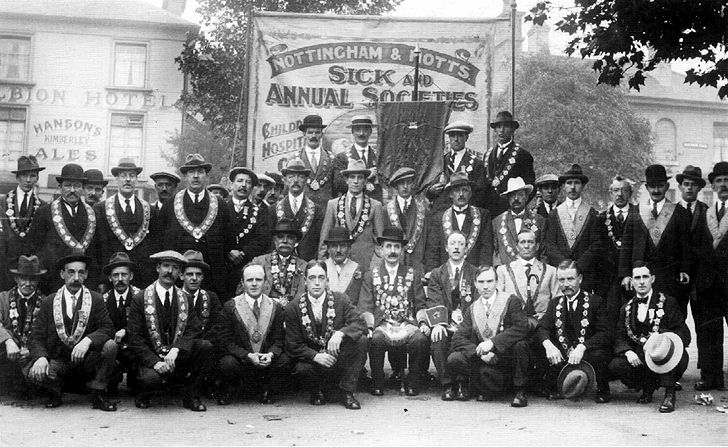 The people posing for their photograph are either locals about to go on a jaunt or possibly a party from outside Nottingham who have arrived at the Albion with the intention of taking refreshment before continuing on their journey. If anyone thinks they recognise anybody in the photograph do let us know. This image was found among a batch of old photographs. It shows a group of individuals stationed on the triangular patch of ground that was bounded by Sherwin Road, Willoughby Street and Castle Boulevard. The Albion Inn is clearly visible in the background. It appears that the local area was hosting a gathering of members of the Royal Antediluvian Order of Buffaloes. The large banner positioned behind them clearly relates to their charity. We have no date for the photograph but suspect it was taken in the early twentieth century. This photograph was probably taken about 1955 and shows the end of Sherwin Road at its junction with Willoughby Street and Park Road. 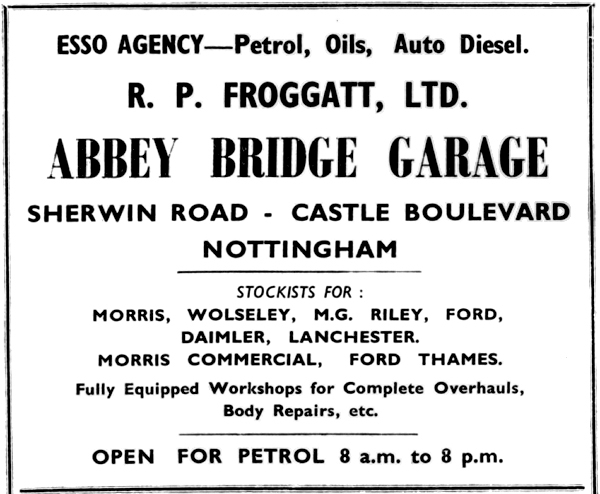 It dates from when road works were being undertaken in conjunction with the establishment of the Abbey Bridge roundabout. The short terrace of properties is the same one as can be seen to the right of our main photograph of the Albion Inn. 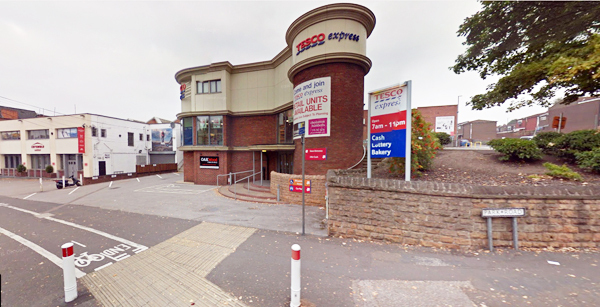 Their site is now incorporated into Tesco's car park. 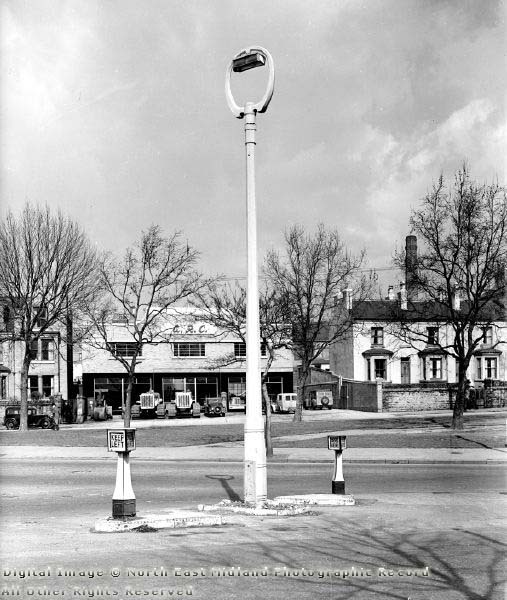 This 1950s photograph was commissioned by the Stanton Ironworks Company as a publicity shot because it shows one of their new concrete lamp posts erected at the junction of Abbey Bridge and Castle Boulevard. 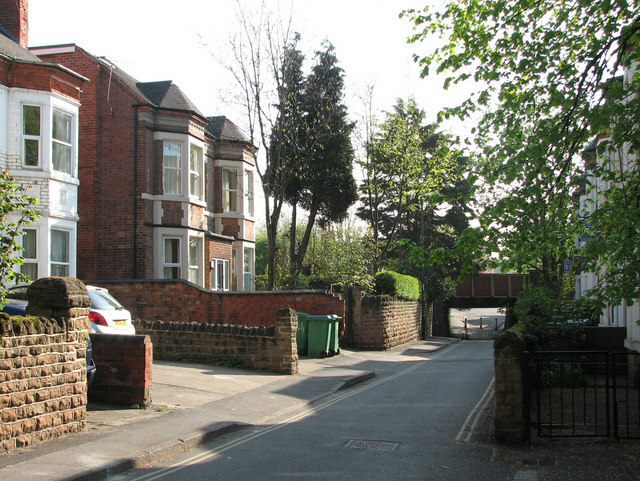 However in the background cane be seen a stretch of Sherwin Road including Froggatt's 'Abbey Bridge' Garage. Its site now houses the Cotswold Outdoor Store while the buildings on the right made way for the Lancers pub. This photograph can currently be found on the Picture the Past website. For more information about how to get a copy of the photograph click here. We know little more about R.P. 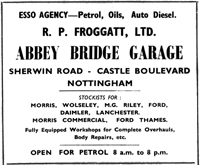 Froggatt and his Abbey Bridge Garage than what can be found in the advertisement shown here. This 1979 photograph, taken by Peter Holland, features the terrace of three storey properties on Sherwin Road which lie between the junction of Harley Street and what was then Castellini's show rooms. These particular properties were evidently considered in a sufficiently good state of repair that they did not need to be demolished as part of the general clearance of the Willoughby Street area. 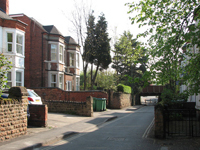 This 2015 photograph shows part of the terrace of houses stretching between Harley Street and Chilwell Street. 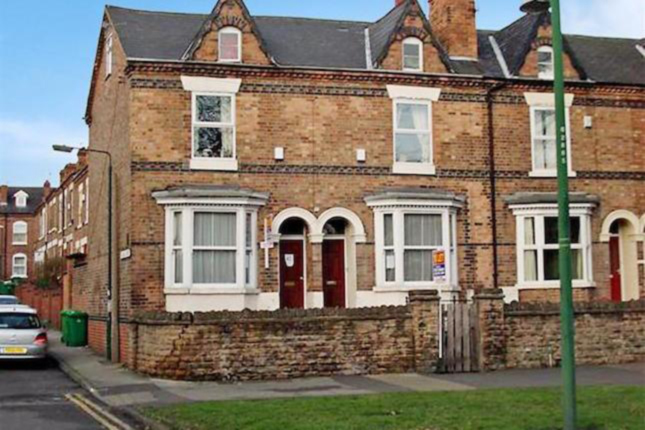 Like most properties in this area, at the time of writing , they are rented out as student residences. 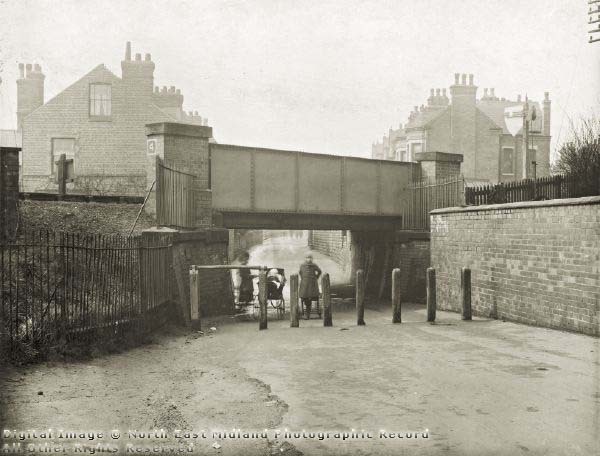 Taken in February 1923 the photographer was standing with his back to the Boulevard and focusing on the bridge that carried the railway line over Sherwin Road. 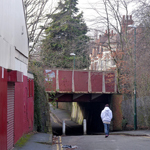 The bridge's lack of elevation meant that this section of Sherwin Road was not accessible by motor vehicles. 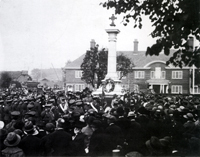 This photograph can currently be found on the Picture the Past website. For more information about how to get a copy of the photograph click here. 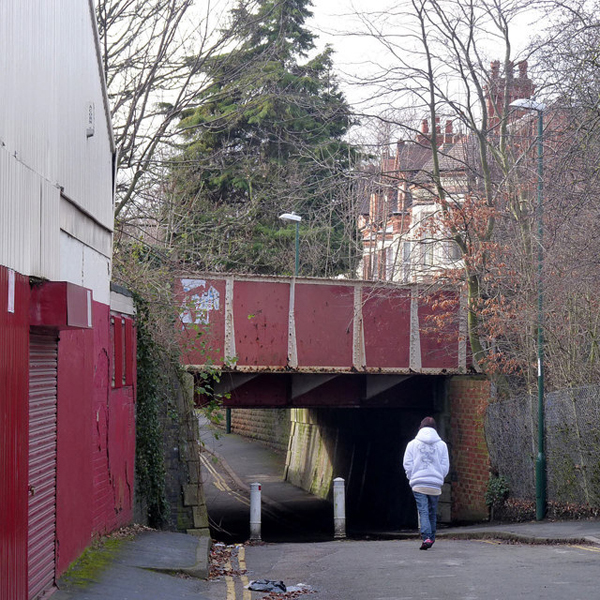 More or less the same view as in the previous photograph but this one taken by Alan Murray-Rust in April 2011 and shows the end of the complex of buildings that were subsequently built alongside this stretch of railway between Sherwin Road and Grove Avenue. This photograph originally appeared on the Geograph website - click here to see more of Alan Murray-Rust's photographs. In this photograph, also taken in February 1923, the photographer has gone under the railway bridge and is now looking back towards the Boulevard. 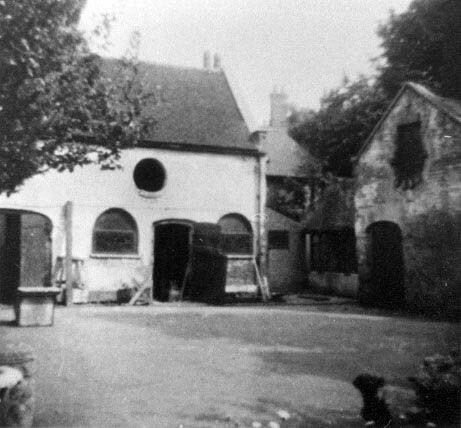 Immediately on the left is part of the greenhouse complex that Albert Ball senior had erected next to his house when the family moved in during the 1890s. By the time this photograph was taken the Ball family had moved to the park and were living at Sedgley House on Lenton Road. 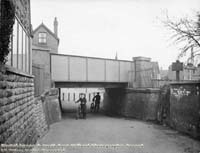 The house just visible on the other side of the bridge would have been on Albert Road and it and several neighbouring properties were demolished in the 1960s in order to permit the enlargement of the school playground. This photograph can currently be found on the Picture the Past website. For more information about how to get a copy of the photograph click here. 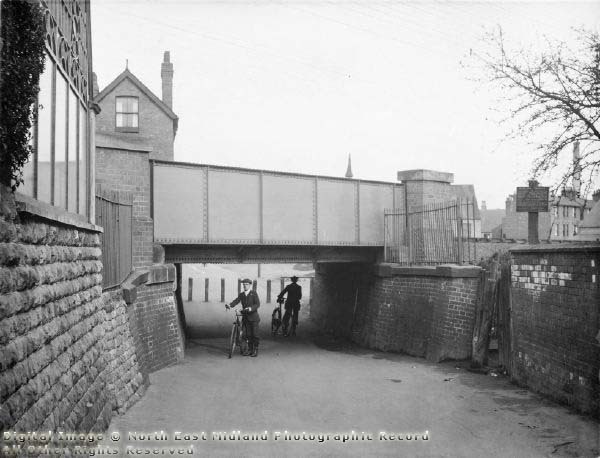 John Sutton took this view of Sherwin Road in 1911. He was aware that this last house had been the childhood home of Albert Ball V.C. so he included it on the Geograph website. Click here if you would like to see more of John Sutton's photographs. Originally this served as the gatehouse to a property known as Flora Cottage. The latter was a substantial property which was pulled down in the 1890s to be replaced by all the houses that make up Sherwin Grove. The gatehouse is now called Fothergill Cottage. 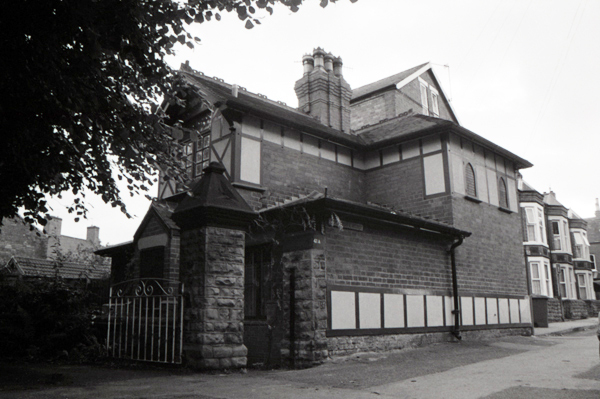 Photograph taken in 1991. The same property as in the previous photograph but this shot was taken in 2016. 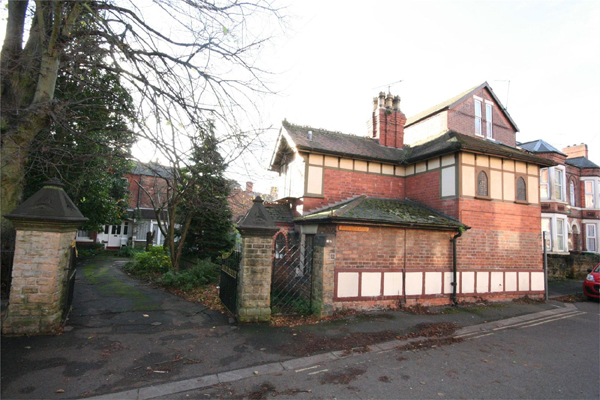 We can also see another property in the background which probably dates from the mid-nineteenth century. 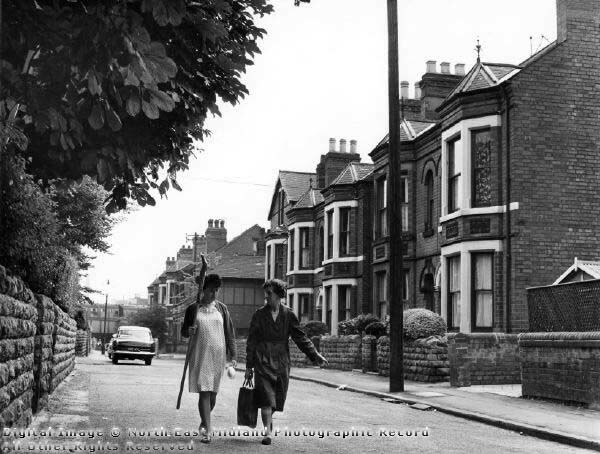 In many ways the part of Lenton has changed very little since this photograph was taken in 1966. The major difference is in the occupants. Back in 1966 it would be home to a range of ordinary residents now it is predominantly a student enclave. This photograph can currently be found on the Picture the Past website. For more information about how to get a copy of the photograph click here. 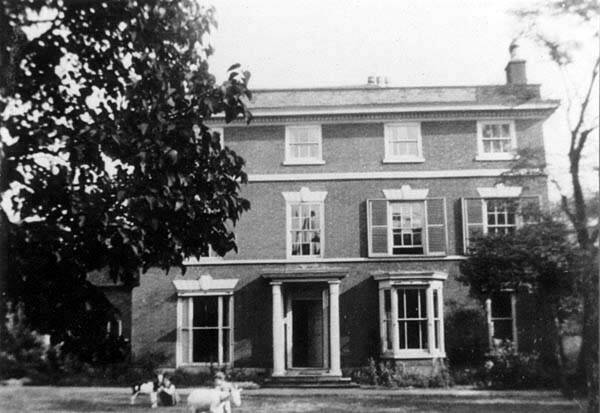 Birch House in the late 1930s. Later it became the base for Mitson's chocolate business. The site is now occupied by the Mirberry Mews properties The full story of Birch House and its various occupants can be found in Lenton Times No.6. This is one of the outhouses in the grounds of Birch House. Although the main property was demolished this building was retained and converted into a residential property within the Mirberry Mews development. The building at the rear of the photograph is part of Sherwin Grove. The strange structure in the foreground is the remains of a glasshouse rockery constructed by the owner of Flora Cottage, the property pulled down in the 1890s to make way for the construction of Sherwin Grove. 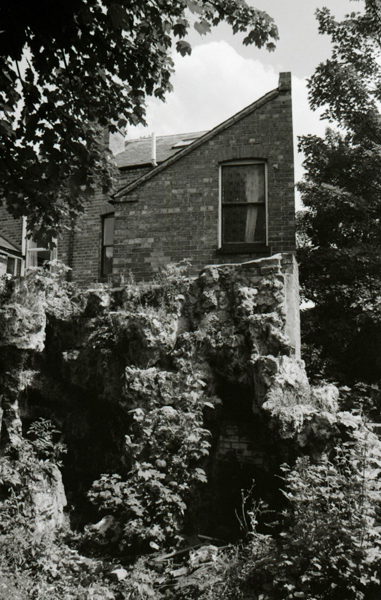 The rockery was still there in 1991 when this photograph was taken but has since been removed. 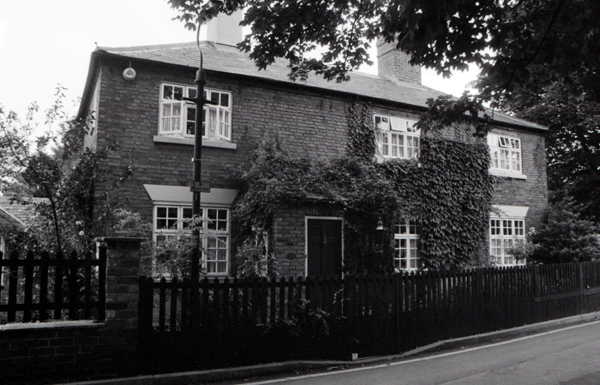 Serendipity Cottage as it looked in 1991. This property used to have 'bricked-up' windows in order to avoid the Window Tax but these have since been replaced with real windows. 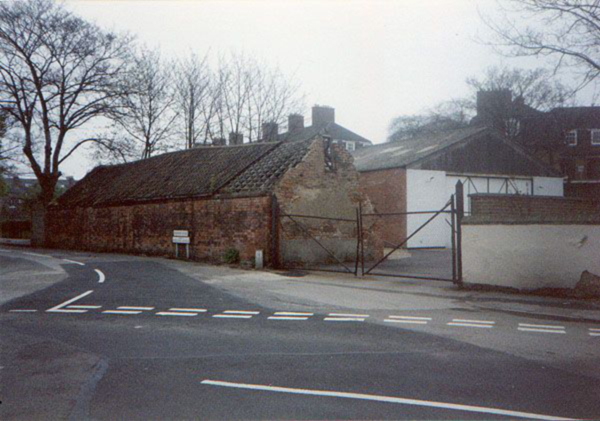 The junction of Church Street and Sherwin Road with an old farm building alongside the road. This and the more recent building behind it both came down to make way for the new Ear Foundation property. 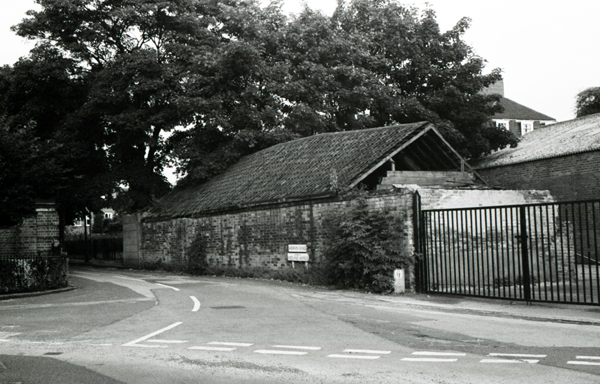 A second shot of the farm building ï¿½ this one taken in 1991. 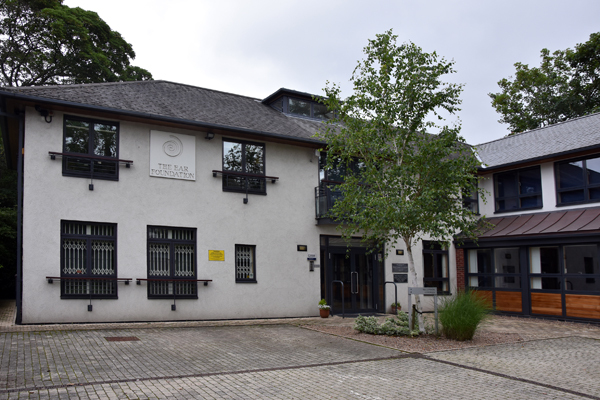 The Ear Foundation acquired Trafalgar House in the early 1990s. By then the property had been unoccupied for several years and had become prey to squatters. The squatters have long since gone. 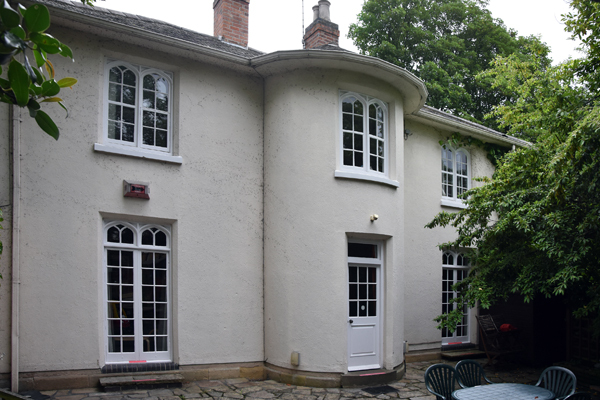 The property has undergone a major refurbishment and is now known used as accommodation for families visiting children in the QMC who are being implanted with cochlear hearing aids. A 2016 view of 'Trafalgar House' taken from the garden. This view is not usually available to passers-by as the garden is obscured by a high wall and trees. The Ear Foundation renamed the property the Marjorie Sherman Centre after a major benefactor to the charity. In 2015 the final part of the Ear Foundation's new building was completed and this can be seen on the right of the photograph which was taken the following year. 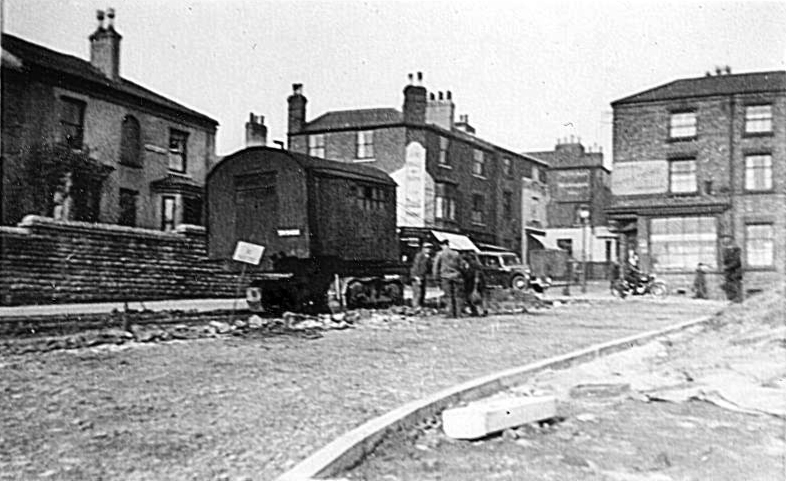 The junction of Sherwin Road and Church Street in 1921. 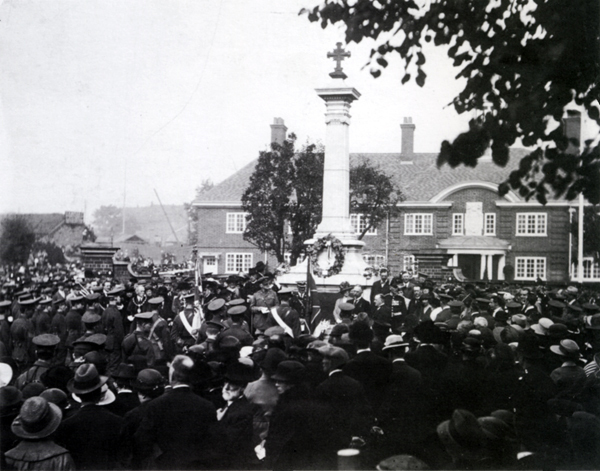 The crowd has gathered to witness the opening of the Captain Albert Ball V.C. Memorial Homes paid for by his father, Albert Ball senior. This photograph can currently be found on the Picture the Past website. For more information about how to get a copy of the photograph click here. At the end of September 2015 Sherwin Road made the local headlines for all the wrong reasons. 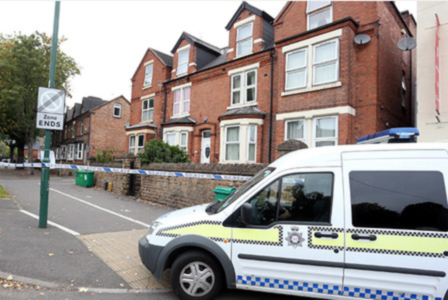 A 50-year old man had been stabbed in one of these Sherwin Road properties. He was subsequently taken to the QMC where his wounds were treated. 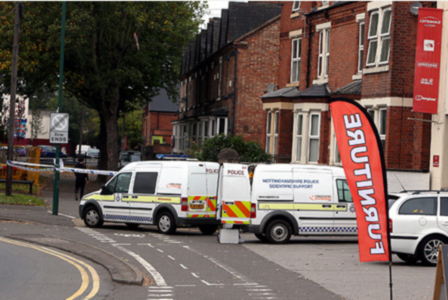 The police arrested three men and two women as a result of the incident. 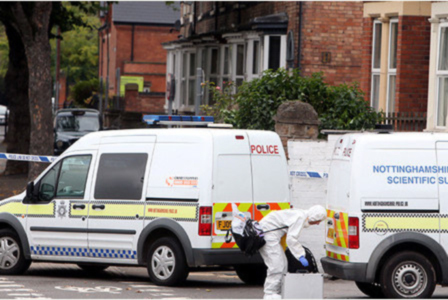 The three photographs shown here are of the crime scene vehicles collecting forensic evidence the following day.